The fascination of sports will never cease to captivate people. As experts in sports facility illumination, OSRAM Lighting Solutions brings the best lighting to every part of the venue, making sure athletes and spectators can enjoy the magic to the fullest. Sports facility lighting must meet stringent quality standards. We make sure your venue gets the brilliant, glare and flicker-free illumination it needs for gripping sports events and outstanding TV and video quality while utilising state-of-the-art, highly energy-efficient technology. Let the exterior of your sports centre radiate the excitement within by transforming it into a dynamic and vibrant display of colours, video content and graphics. 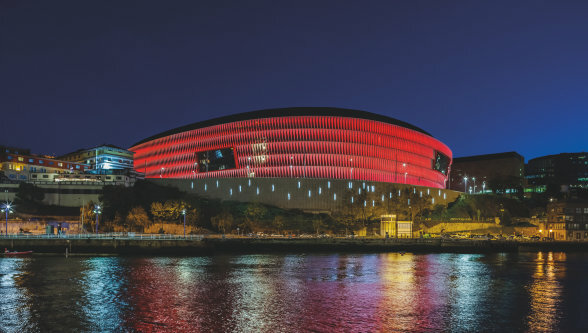 OSRAM Lighting Solutions will present your iconic venue in the best light. Where many vehicles arrive or leave at the same time, clear vision helps prevent accidents while improving orientation. Our highly energy-efficient, glare-free, motion sensor-controlled lighting systems save money, enhance safety, and improve sustainability. From offices and commentator booths to changing rooms, VIP lounges and spas, OSRAM Lighting Solutions has the technology and know-how to provide the right illumination solution for every room and space of your sports facility, regardless of its size. Sport is more than simply a competition for top performances, goals and viictories, and also more than a spare time activity. Sport is emotion, in good times and bad times – and that‘s true for the big events as well as on a small scale. And therefore, the right light is crucial – for athletes, referees, spectators and cameras.